This book is a study of the workings of the Discretionary Lifer Panels of the Parole Board, the body charged with the responsibility for making decisions on the release of discretionary life sentence prisoners. It traces the origins and development of the Discretionary Lifer Panels following the landmark Weeks and Thynne decisions of the European Court of Human Rights which led to the establishment of DLPs, and examines the way in which the DLPs developed subsequently - often rather differently to what was originally envisaged as necessary to comply with the decision of the ECHR. 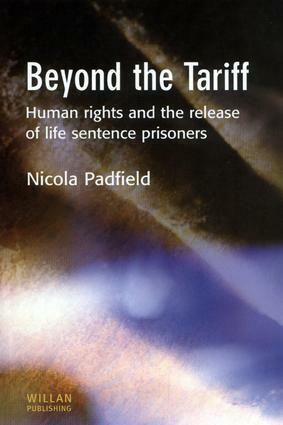 This book provides a fascinating case study of a little-known part of the criminal justice system, and explores at the same time the wider issues that have arisen - in particular the impact of the ECHR and the Human Rights Act on the criminal justice system; the relationship between the Parole Board and the Prison and Probation Services; the differences between release procedures for different categories of life sentence prisoner, and those detained compulsorily under the Mental Health Act;the broader social, legal and political context in which DLPs operate, and the nature of discretionary decision-making in the criminal justice system field. the first detailed study - from a leading authority in the field - of the way decisions are reached on discretionary life sentence prisoners explores the impact of the decisions of the European Court of Human Rights and the Human Rights Act on the working of the criminal justice system of interest to practitioners and academics concerned with the criminal justice system.